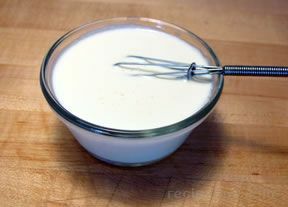 A French sauce that is basically a thickened cream substance, which can be served as a topping for fruit, applesauce, cobbler, or pudding and can also be used as a thickener in sauces. 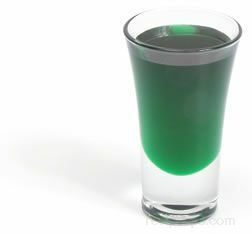 It provides a somewhat nutty and slightly sour or tart and tangy flavor to the food on which it is used. The texture and taste can range from a fresh cream to a sour cream. 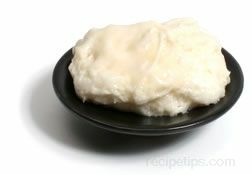 The French use unpasteurized cream when making Crème Fraîche, so the bacteria present in the cream serves to thicken the substance. In the U.S., the cream is pasteurized, so buttermilk and sour cream are added as agents to ferment the substance for the proper consistency. 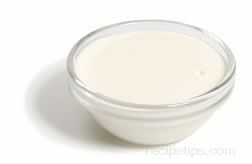 Due to the high buttermilk content in Crème Fraîche, it will not curdle when cooked. 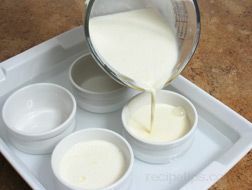 To make Crème Fraîche, combine 1 tablespoon of buttermilk with a quart of whipping cream and allow the mixture to thicken for 10 to 20 hours at a room temperature of 70 degrees. 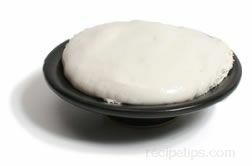 A similar topping called Crema is used in Spanish, Mexican and Latin American cooking and is a good substitute for Crème Fraîche.